ELEY tenex slow biathlon: control without compromise. 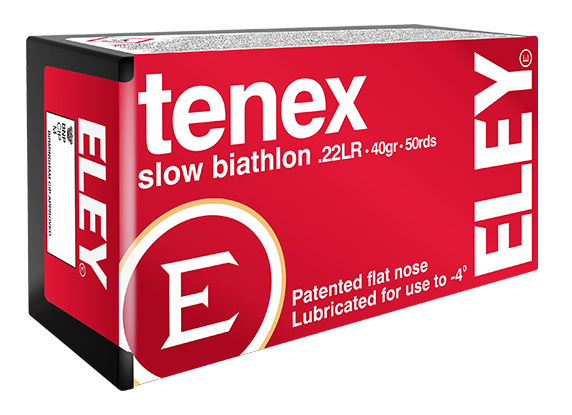 ELEY tenex slow biathlon was launched in 2017 to offer a lower velocity cartridge to elite biathletes. A reduced propellant charge improves rifle control to facilitate rapid shots on target, while retaining sufficient energy to knock down the target. It is a companion cartridge to the ELEY tenex biathlon round with greater velocity and energy. An extensive course of research and development went into the creation of ELEY’s biathlon cartridge range. Examination of bullet and chambering characteristics at freezing temperatures led to a reduction in the diameter of the cartridge to aid cycling in bolt-action or straight-pull biathlon rifles. A scientifically designed lubricant was developed to suit cold temperatures, aiding consistency and reducing barrel wear. ELEY tenex was used as a platform on which to build this new cartridge. The iconic flat nose projectile of ELEY tenex is one of many innovations pioneered by ELEY’s engineers. As it cuts through the air the revolutionary design pulls the centre of pressure forwards, aerodynamically stabilizing the projectile and increasing accuracy at the target.